The Bath Royal Literary and Scientific Institution is delighted to announce that they will be hosting some exciting guided trails over separate weekends of the summer. The Nelson Society and the World Heritage fund under the auspices of BRLSI are jointly staffing four guided walks around the city. 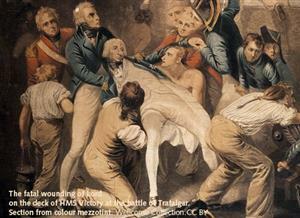 The heroic story of England’s most famous sailor has inspired generations, but it is not well known that Nelson, hoping to recuperate from illness and battle injuries, was a frequent visitor to Bath, along with his wife, Fanny. The guided walks will last just over an hour and will highlight some of the key locations on the southern route of the Nelson trail, with expert commentary. Each walk starts at 11am from BRLSI Reception and for the fee of £5, walkers will receive a professionally designed trail guide, a guided tour, and a complimentary tea or coffee at the end of their morning. These trails will compliment an exhibit taken from BRLSI’s ‘Chosen’ exhibition. ‘Chosen’ sees guest curators take inspiring and intriguing objects from the BRLSI collections and place them in a new light and one of those exhibits is a phial of brandy from the barrel in which Nelson’s body was carried back to these shores from the Battle of Trafalgar. Nelson aficionados have travelled from far and wide to view this small treasure and here is a chance for Bath residents to come and see it both up close and for free. What a fascinating way to spend a summer morning!